Eat Your Words is new this week as host Cathy Erway is on the line with Courtney White, author of Two Percent Solutions for the Planet. 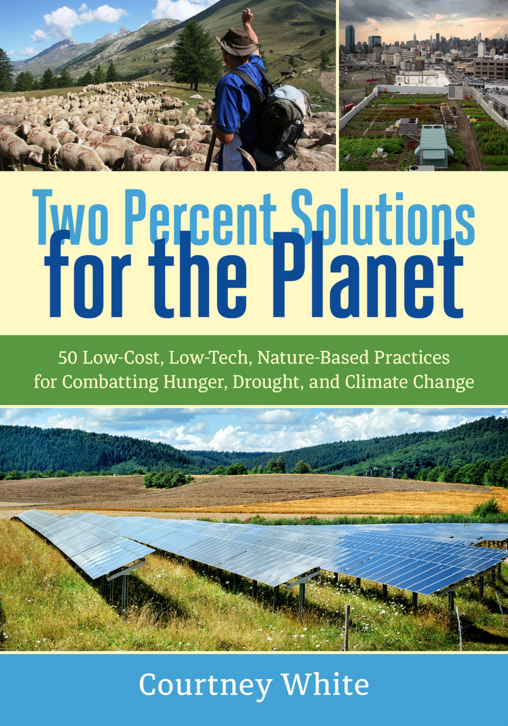 Two Percent Solutions for the Planet profiles fifty innovative practices that soak up carbon dioxide in soils, reduce energy use, sustainably intensify food production, and increase water quality. The “two percent” refers to: the amount of new carbon in the soil needed to reap a wide variety of ecological and economic benefits; the percentage of the nation’s population who are farmers and ranchers; and the low financial cost (in terms of GDP) needed to get this work done. As White explained in his previous work, Grass, Soil, Hope, a highly efficient carbon cycle captures, stores, releases, and recaptures biochemical energy, mitigating climate change, increasing water storage capacities in soil, and making green plants grow. Best of all, we don’t have to invent anything new—a wide variety of innovative ideas and methods that put carbon back into the soil have been field-tested and proven to be practical and profitable. They’re mostly low-tech, too, relying on natural resources such as sunlight, green plants, animals, compost, beavers, creeks, and more. In Two Percent Solutions for the Planet, White expands what he calls the “regenerative toolbox,” to include holistic grazing, edible forests, biochar, weed-eating livestock, food co-ops, keyline plowing, restoration agriculture, bioenergy, aquaponics, animal power, Farm Hack, bees, bears, wildlife corridors, rainwater harvesting, native seeds, and various other projects from across the United States, as well as in Canada, Europe, and Australia. These short, engaging success stories will help readers connect the dots between diverse, exciting, and pragmatic practices, and inspire them to dig deeper into each individual story and concept, energized by the news that solutions abound.